The file Hungarian Flavor v.4.4.1 is a modification for Hearts of Iron IV, a(n) strategy game. Download for free. 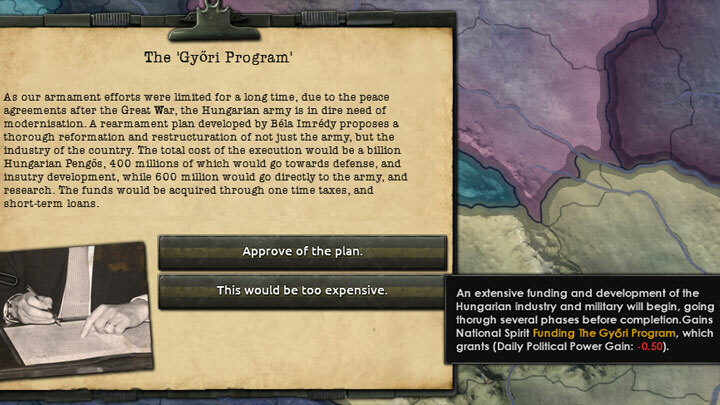 Hungarian Flavor is a mod for Hearts of Iron IV, created by Muller. Hungary is already an interesting country, as it has a lot of room for expansion, and even some historical struggles, that defined the nation's diplomacy in the years of the war. The main focus of this mod is adding more flavor to the country, primarily with the new focus tree. The political branch allows for either a revisionist policy (which focuses on restoring old territory), or an ideological shift, which enables a democratic, or communist Hungary, each with its own decisions to make. Following the revisionist branch presents opportunities to reform Austria-Hungary, demand former territories of the realm, and even develop the newly acquired lands. Extract into „My Documents\Paradox Interactive\Hearts of Iron IV\mods” and activate in game’s menu.